Camera manufacturer and software company Phase One today released Capture One Pro 10, an update to the company’s all-in-one photographic workflow tool. The update adds new features, and improves editing speed. 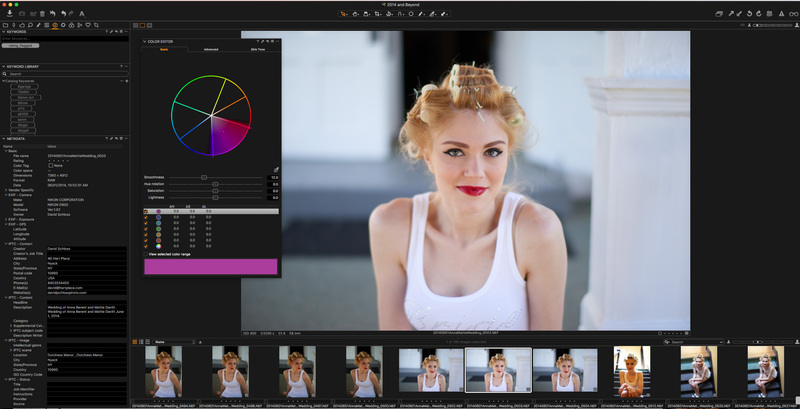 With CaptureOne Pro 10 released, the industry’s alternative to Lightroom gains more features. I’ve been working with the beta version of Capture One Pro 10 for weeks now, and it is in fact faster and more streamlined that Capture One Pro 9. The interface for Capture One Pro is a bit more daunting than Lightroom, but the program is equally deep, providing very pre use controls over common editing functions, and tools that are not available in Lightroom. For instance, the color editor allows for picking dozens of individual color points and adjusting them globally or locally. The interface for Capture One Pro is non-modal, meaning there’s no need to jump between “modules” to perform work—files can be moved between folders in the same panel as editing takes place. Capture One Pro has robust tethering capabilities, working not just with PhaseOne’s own cameras but a whole range of current and previous digital cameras. Another strength of Capture One Pro is the highly customizable interface. It’s possible to create and save any number of workspaces, similar to the functionality in Adobe Photoshop, and to customize any tab or floating tool. It’s possible, for example, to make a floating “favorites” editing palette with the most commonly used tools, and also have it include a filter pane for quick selection of images. As another example, users working on laptops that occasionally connect to a desktop screen can set up workspaces for the laptop-only workflow and a separate workspace for dual displays with pallets positioned on the secondary display. Capture One Pro emphasize a professional workflow, with the ability to automatically import images into sub folders folders based on variables (import into separate folders for cameras, or into folders based on capture date, for example), and to batch process output. These customizable output tools allow photographers to quickly export to multiple sizes and locations at once. Export a high res folder of TIFF files for a client while also creating web-resolution files with watermarks. Like importing tools, the export tools can also work with variables, to create folders and file naming to match the conventions required by a client. Capture One Pro previously introduced a powerful local adjustment tool for brushing on layers and that seems to perform more quickly than before. Adjustments, including local area adjustments and metadata, can be copied and applied among images or saved as presets to apply all at once to a selection of images. Metadata is also stackable, so it’s possible to create a preset for basic copyright information and then add the location name for the shoot, and then add a model release template, etc. We will be posting a video introduction to Capture One Pro 10 next week, where I will be working with the company’s David Grover on an online trip through the new features and functionality, to help users understand the power of the new features, and the tool set of Capture One Pro. COPENHAGEN, December 1, 2016 – Phase One today released Capture One Pro 10, a major release of the world’s premiere raw conversion and image editing software. Designed to support wide ranging workflows of both professional and passionate photographers, Capture One Pro is known and trusted for rendering the finest image color and detail from more than 400 digital camera models. Now, based on customer feedback, Capture One Pro 10 puts superior user experience center stage – with interface improvements, under-the-hood tuning, and exciting new features that furnish the fastest, most reliable and most powerful performance yet. Enhanced User Experience. Faster browsing, zooming, panning, and ease in switching between images even at 100 percent view. Also, a new default workspace offers a more intuitive experience for new users, with examples for getting started. User-defined output sharpening in the recipe tool. For print sharpening, users can also specify the distance from which the final output image should be viewed. On-screen proofing. An enhanced proof mode takes the guesswork out of the raw conversion process. From the viewer panel, users can now simulate the final size, resolution, color, compression artifacts and sharpening of images. This is especially useful for live assessment of files – particularly small files for the web and for optimizing image compression quality. A look into the future of image editing: Inspired by video grading processes, users can now access Capture One Pro directly through a Tangent panel system. This fully integrated panel is literally a new interface into image editing – for deep dive color and image adjustment –– allowing fast, multiple input commands simultaneously, while viewing the master monitor as the editor “feels” input into the application. A camera focus tool module for tethered cameras — especially useful for product, still life, macro, and Cultural Heritage photography projects. New camera support includes: Olympus E-M1 mkll, Sony RX100M5, Sony A6500 and Sony A99M2. For a complete list of newly supported cameras and lenses, please go to: www.phaseone.com/download. Capture One Pro 10 is available now for the Mac and Windows operating systems online at www.phaseone.com/store and from Phase One authorized partners worldwide www.phaseone.com/partners. Owners of Capture One Pro 8 and 9 may upgrade for 99 USD or 99 EUR. For customers who have purchased Capture One Pro 9 since November 1, 2016, Phase One is offering a grace period, exempting them from the upgrade fee. Eligible customers can download their upgrade today at phaseone.com/download and reuse their license key. New customers can purchase Capture One Pro 10 for 299 USD or 279 EUR. Capture One Pro is also available by subscription. Capture One Pro (8 and 9) subscribers can simply download the new Capture One Pro 10 release. A single-user subscription is 15 USD / 12 EUR per month for a 12-month plan. Please see all subscription options at www.phaseone.com/store. Phase One A/S is the world-leading provider of medium format digital photography systems and imaging solutions for professional photographers and industrial applications. Established in the early 1990s, Phase One is a true digital photography pioneer with a passionate commitment to image quality excellence and creative freedom. Phase One’s engineering and design expertise has produced imaging breakthroughs from high-resolution camera systems to advanced software for better photographic workflows and raw file editing. Phase One’s understanding and ability to optimize hardware and software integration underscores their award winning Capture One Pro software – widely preferred by professional photographers. Phase One’s industrial division focuses on imaging accuracy for industrial applications ranging from aerial image acquisition to cultural heritage preservation – from mapping the globe, to protecting priceless works of art and documents. Today, with control over all aspects of the medium format camera system supply chain, Phase One is uniquely positioned to help photographers and imaging experts everywhere stand out above the competition and realize their creative visions without compromise. Based in Copenhagen Denmark and embracing the high demand of Scandinavian design excellence, Phase One is dedicated to delivering the best image quality and user experience. With offices in New York, London, Tokyo, Cologne, Hong Kong, Shanghai and Tel Aviv, and with its expert teams of global partners, Phase One is committed to serving and supporting its customers worldwide. Phase One and Capture One are registered trademarks of Phase One A/S. All product names are trademarks or registered trademarks of their respective companies.